We are the Wanneroo Flag Marshal Association (WFMA). We control Flag Marshalling duties for major circuit racing events in WA and are always on the look out for new volunteer members. Flag Marshals are an integral part of any Motor Racing meeting. We are additional “eyes and ears” to the drivers, which helps them compete as competitively and as safely as possible. By the use of various coloured flags and lights, we signal warnings and other information to the drivers on the circuit, while they are practising, qualifying or racing. We’re as close to the action as you can get (without being in the car!!). 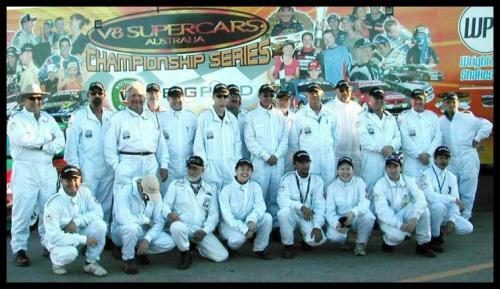 We flag at WA Sporting Car Club (WASCC) meetings at Barbagallo Raceway situated 35 km north of Perth city. The Raceway is the hub of motor racing in WA. Established in 1969 and operated by the WASCC, it’s the place where most of the State’s motor racing action happens. The easiest way to Barbagallo Raceway Wanneroo from the CBD is: Travel north on the Mitchell Freeway Turn right into Burns Beach Road. Continue left onto Joondalup Dr. Turn left into Pinjar Road and then left into Wattle Avenue and proceed to the end. At which point you will reach the main entrance of Barbagallo Raceway. 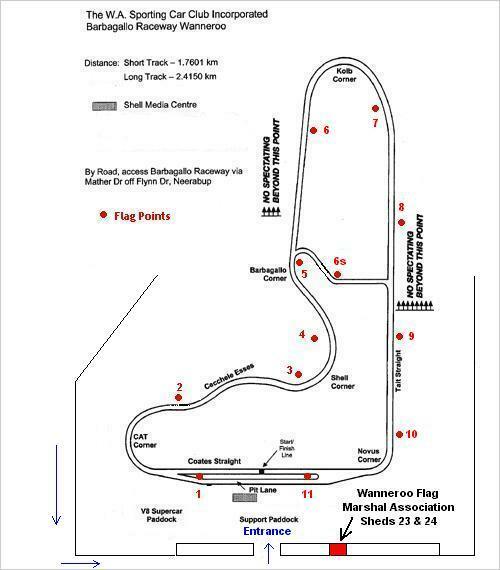 We also flag at Collie Motorplex, and other small events in the state (including Drifts, Dirt Trackers Karts, Targa West, Super Karts and Vintage Sports Car Club events). On average meetings are held once a month but can vary depending on the type of events run. A typical club race meeting is held on a Saturday or Sunday and requires flaggies to be at the track around 7.00 am and will run until around 5.00 pm. There is no penalty if you cant make a meeting, simply let us know in advance. We generally email out an upcoming event and ask if you will be attending or not. Check the website calendar for upcoming events. You must be 18 years old to gain access to the competition area (the track). If you are between 16 and 18, you will need a guardians consent. Long trousers and covered shoes are essential. A hat and warmer clothes for most meetings are preferred, (it can get breezy). Please avoid wearing bright tops or jackets, such as Red, Yellow, Green, Blue or florescent colours (like reflective safety vests). Snacks you may want to eat and a Thermos of coffee etc, you can take a back pack out with you to the flag point. We will provide sun block, ear plugs and wet weather gear as well as amazing people to assist you. During the officials break we provide a meal (please advise any dietary requirements) plus cool drinks to take out on the course with you as well. Not forgetting we’ll train you in the flagging rules! Please don’t worry if you do not have any flag marshal experience, everyone has to start somewhere and our senior members will gladly show you the ropes and guide you through a meeting. If you enjoy it, you can come back some more and sign up with the club. We do not throw you out on a flag point by yourself, you will always be with an experienced official and it’s really not that hard to do. What does it cost to join the WFMA? WFMA membership is only $30 for a working Adult or $15 for concessions per annum, (or part thereof). Your membership is not only a commitment to the club, but also helps pay for basic associated costs during the year, such as newsletters, facilities etc. Once you start training, you can complete the WFMA Membership Application and receive a Seasons Pass from the WA Sporting Car Club (WASCC) which offers free entry into club meetings for you and a guest who attends with you, (they do not have to flag, they can just be a spectator). You will have the satisfaction of being able to contribute to an exciting sport, plus get up close to the action on the “other” side of the fence. You will enjoy being part of a group of enthusiasts, who share the passion of motor racing, as well as forming some great friendships and having some fun along the way. Plus you will get to see all the action for free. How can I try out or join?